The above photo was cropped from a photo of P8 (as lead crew) w/P-14, P-53, P-5, P-2 in formation. 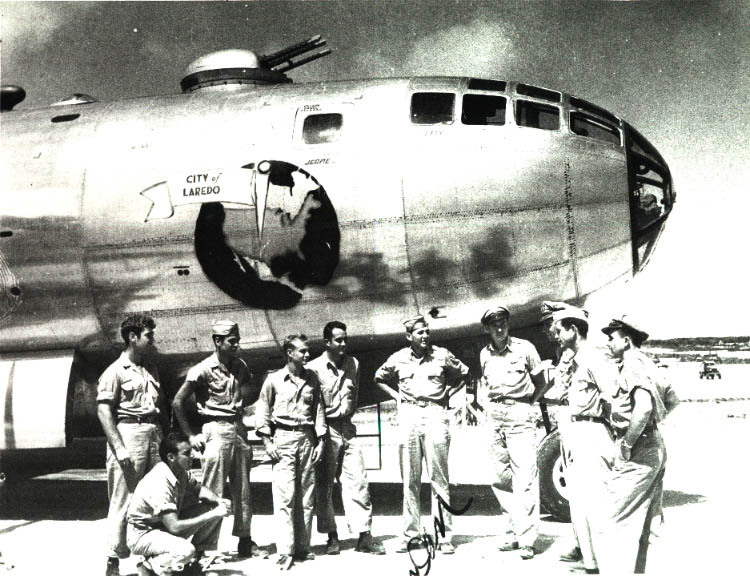 In comparing the placement of "7" shown on this plane with the photo of "City of Laredo" (the crew's 2nd B-29 see link for 44-61795 on Nav bar above) this must be Crew 7's first B-29 44-69810 - "Old P-7"
Missing: 1st Lt. Lewis D. Barton, Navigator. He was hospitalized with a kidney infection that day. Members were assigned to the crew in mid 1944 while at Smoky Hill Army Air Field in Salina, Kansas. They trained there and at Batista Field in Havana, Cuba until March of 1945. From Kansas they went to Mather Field in Sacramento, CA and then on to John Rodgers Navy Base in Hawaii. Their next location was Johnson Island and then on to Eniwetok, Kwajalein. Finally; North Field, Guam. This may be helpful in trailing the where abouts of "City of Laredo": When the war was over the B-29s and their crews were to fly back to the USA. Realizing that anything could happen dealing with so many planes the plan was developed to send an especially fitted out B-29 to the Pearl Harbor area (John Rogers Air Base) to act as an "Air-sea Rescue Unit". Guess who got the duty? None other than P-7 with its sophisticated radar equipment. We remained there on alert round the clock (mostly playing bridge) for the entire movement of "The Sunset Mission" as it was called; returning all flyable planes back to San Francisco. When our duty was complete our original orders were to fly the plane back to GUAM! Well, when that time came our flight engineer reported to me that the plane had a severe landing gear problem that would take some time to repair! As this was relayed to our headquarters on Guam, back came orders that when the gear was back in operation that the plane should be returned to the USA, following the a same procedure as the Sunset Mission. Needless to say the gear got operable in short order and back home we came, seeing the welcome home sign hanging from the Golden Gate bridge and upon landing at San Francisco and deplaning was the last time we saw the City Of Laredo". I think all of us were only interested in getting discharged and back home to civilian life. Let someone else take care of her! 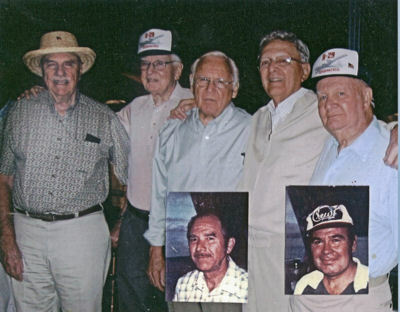 Eight of the 11 P-7 crewmembers met In Washington D.C. on to commemorate their 50th Anniversary. One (Reinhold) passed away a few years ago and William Badgely had developed heath problems and could not attend. Follow up: Orders dated 26 October 1945 show that following Air-Sea Rescue assignment at John Rogers, Crew 7 proceed to Mather Field under the "Sunset Project with B-29 # 42-94031. Crew 7 personnel for Air-Sea Rescue consisted Capt. Chester Juvenal, AC; 1st Lt. Ralph Hardin, Pilot; 1st Lt William E. Badgely, Bomb. ; 1st Lt Daniel R. Jesser, Radar Observer; S/Sgt Richard H. Little, Radar; Sgt Howard L. Reed, RG; S/Sgt Edmund Reinhold, LG; Sgt Edward T. Reilly, TG of the original crew and the following personnel assigned as replacements: Capt. William F. Barthel, Navigator, (P-13); M/Sgt Edwin L. Savage, FE, (P-18), T/Sgt Steward L. Hinds, CFC; S/Sgt Leonard Trester, Radio Operator, (P-12); S/Sgt Walter T. Jordan, Crew Chief. Sources: Chester Juvenal, Elmo Huston, and the "History of the 39th Bomb Group"